Finally Big Apple is here in Penang at Gurney Plaza. However most of the donut offered today were too choc-ky . And my peanut butter donut is nowhere to be found. Well, let’s see whether it will survive in Penang. I didn’t see any queue on a Saturday. Maybe they didn’t do much publicity and I only found out about it when shopping there. 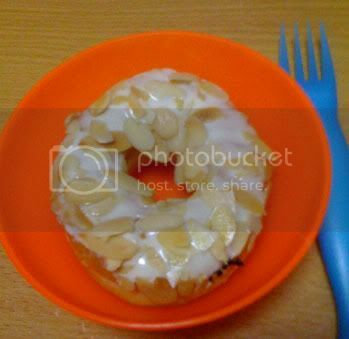 Now will J.CO come over here too? We will see. Many people are addicted to coffee and my mom is one too. However I cannot drink coffee. I remembered when I was young, I was okay with coffee. It did no harm to me right until my University days. It happened one day when I had those boxed coffee drink with milk. I was sick for the whole day. After that, whenever I a sip coffee, I will be sick. I will feel nausea, heart pound faster and just not myself. I am not sure why but it seems that my body system cannot accept coffee. If you say it is caffeine but I can take coke or tea. What’s with coffee that I cannot take? Someone told me that coffee is too heaty for me. 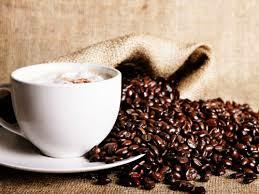 I do love the smell of coffee but just can’t take it. My mom can take coffee like 3 times a day. I wonder does my children have coffee problem. Finally a Domino outlet is opened near my area. Now they delivered to my home. Frankly I never tasted Domino’s before. I always wanted to get my teeth on it but the only outlet was in town. If I go down town, I probably will not go for pizza. 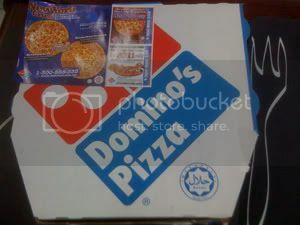 Anyway, I decided to have Domino’s Pizza on Saturday. I tried to register myself online and I failed. They probably didn’t update the database. It kept saying that it didn’t deliver to my area. A bug in the website search engine too. So I picked up the phone to order. The staff that took my order had me repeating my info a few times and worse he mispronounced my name, even though I told him what it was! That is why I preferred to order online. Sigh. The pizza came. 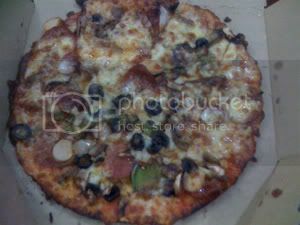 I regretted ordering the thin crust because it is real thin. It was cheesy compare to Pizza Hut. However I found that the toppings weren’t sufficient. 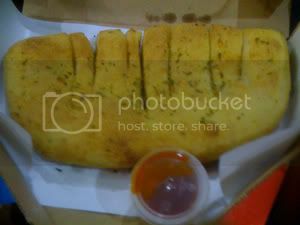 I like the breadstix, it was delicious. 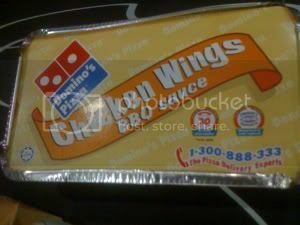 I preferred the chicken wings from Pizza Hut because Domino’s wings have too much BBQ sauce. 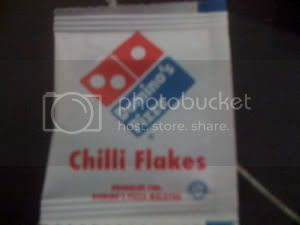 Ooh…they even provide chili flakes for the pizza. I like that. I really should have order Classic Crust! The other day one of my colleagues brought this to the office. 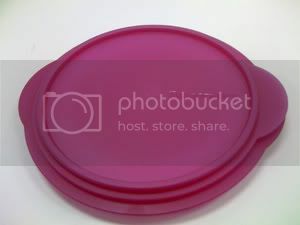 It is a Tupperware container. 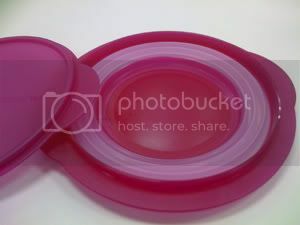 Not just any container but one that you can compress. It is very innovative. When you want to use it, you expand it. After using, you can just compress. It definitely saves some storage space. It was selling at a promotion, 2 for RM14. I didn’t get any because I have a cabinet full of Tupperware or any ware. 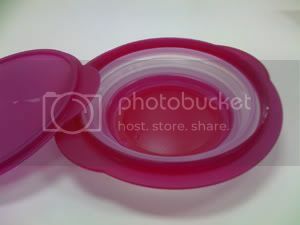 Another thing, I love browsing at the Tupperware catalog or just any catalog. Woman…hehehe. What do you think of Sept 16? It came and gone!…actually 1 hour and 25 minutes to go. 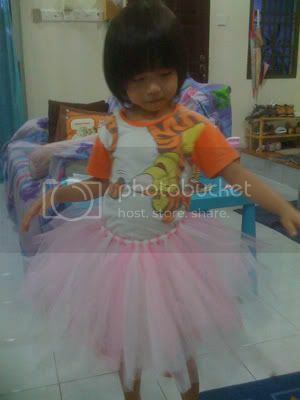 I walked into BATA I Avenue Penang shoe shop to get 2 pairs of school shoes for my children. My children tried on some school shoes and finally found the right size. I asked the old lady sales woman with no expression (not sure why), was there any discount. She told me that there is no discount. I went to the counter and paid for them. Later as I walked out, I saw the same brand with promotion and it was much cheaper. 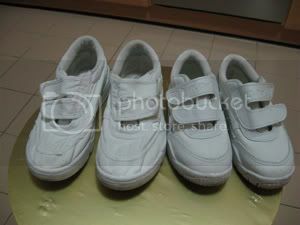 The school shoes were not much different too. I went back to ask the old lady sales woman. She said that those were old stocks and it is an offer item. I asked her why you didn’t tell me that there were offer items available for school shoes. She brushed me off by saying “You didn’t ask!” If I knew, I do not need to ask, right? She is one disgruntled lady that really shooing her boss customers away. I will not go back to that shop ever again to buy any shoes. I love all kind of mango. 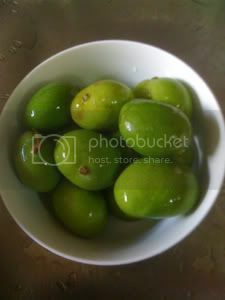 I got a bunch of green mango from the tree in my church. Thanks to my church friend who use a long stick to whack the fruit down. This type of mango cannot be eaten just like that because it is very sour. 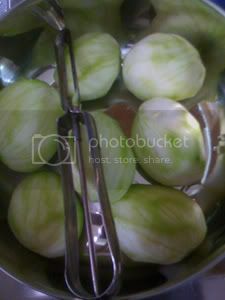 It is good for making preserved mango or eaten with rojak sauce. Some home I love smelling this mango because it is very fragrant. They should make a perfume from this fruit. Here is the simple recipe to make delicious preserved mango. 1. Remove the skin and the seed in the middle. 2. Slice it to pieces. 3. 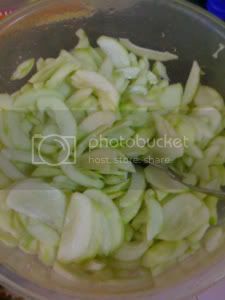 Add 1 teaspoon of salt and mix it. Let it set for 5 min. 4. Add 10 tablespoon of sugar. If you like it sweet, you can add more. 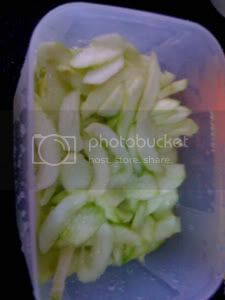 If you like it spicy, you can cut and add some cili padi. Yummy…simply delicious. However I cannot take a lot of this because my teeth will be painful. It is one of my favorite foods. It is cooked glutinous rice in a long big bamboo stick. The bamboo stick is placed on an open fire like bbq. It is good to eat with Rendang beef or chicken. 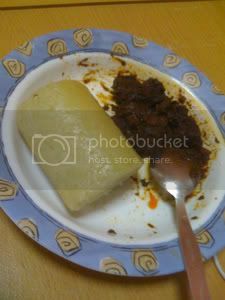 You may only get Lemang during Ramadan or Raya season. Often Lemang is sold by the road side. 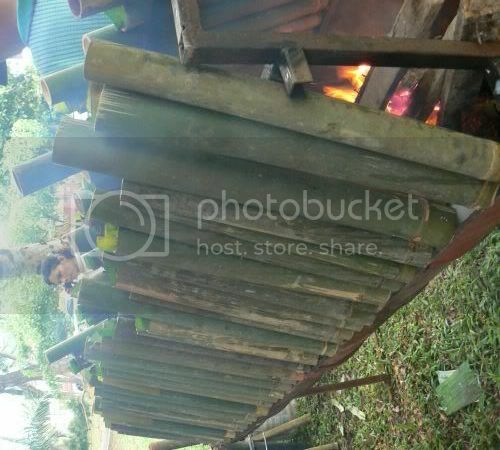 Whenever you see people burning bamboo stick, you be sure there is Lemang to be sold. I am glad that I can find it near Bayan Baru Market or Mosque. At this month of Ramadan, there are stores set up at the open area to sell all kind of malay food in the evening. Besides Lemang, you can find ayam percik, kebab, laksa, murtabak, daging soup, malay kuih and lots of food.